A mayor in the federal land of Bavaria has expressed dissatisfaction with Germany’s asylum policy, by sending a bus with Syrian refugees to Chancellor Angela Merkel’s federal residence in Berlin on January 14. Peter Dreier, mayor of the district of Landshut, stated he wished to «send a signal» that Germany’s asylum policies could not continue as in 2015. 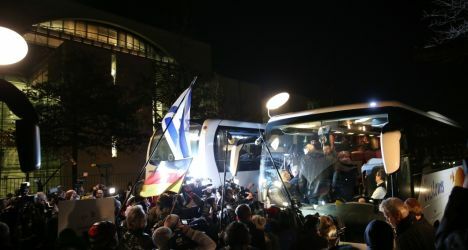 In Berlin, the bus was parked at least for an hour-and-a-half outside Merkel’s official residence, and later drove the passengers to a guesthouse selected and paid for by the mayor. All those on board volunteered to make the journey BBC quotes the mayor’s council as stating. German government spokesman Steffen Seibert announced that that in Germany the state and local authorities were responsible for accommodating refugees, and they were provided with comprehensive support from the federal government.